He stops. And I nearly bump into him. He stands. And looks around. I stand. And look around. Then he starts walking again. He listens, I’m listening. Then he stops again. This time I’m prepared and watch out. Then we start walking again. Over rough and smooth. And sometimes even over very Indiana Jones-ish suspension bridges. Sometimes I hold my breath, when he stops, as if that would improve my hearing. It doesn’t. He, too, doesn’t hear nor see anything. No Orang Utan far and wide. His face is serious. The situation too. In my head. 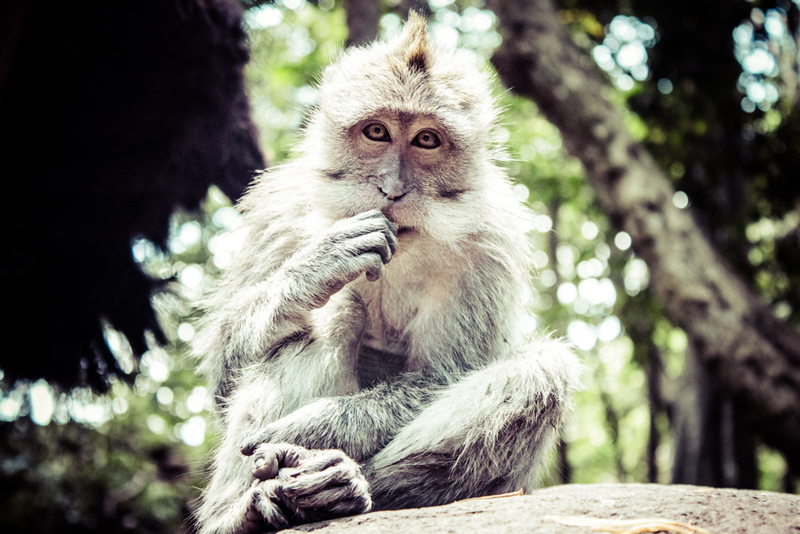 What if we just don’t find any Orang Utans at all? We are deep in the jungle of Borneo. In the middle of nowhere, where lizards and macaques say good night to each other. But actually, we’re not in Borneo. The locals here say, Borneo is only the Malayan part of the island. Here, in the Indonesian part, we’re in Kalimantan, to be exact in East Kalimantan. Where the chances to make out with an Orang Utan are higher than to see a tourist. Kalimantan, that’s the Borneo, no one really knows. During the first five days, while we were trekking through the jungle, driving on dusty roads, shopping at local markets and kissing babies, we’ve seen six tourists. SIX. On a trip over 800 kilometers. That was sooo awesome. We were travelling how I always want to travel. Close to the locals. Without Western food, Western toilets, Western showers and sometimes we also slept like the locals. Plain and simple. I loved it. Kalimantan, the Borneo which is not Borneo, might be one of the very last adventures. Travelling there can be rough and hard, but travelling there feels like real travelling. You can find Orang Utans on both, the Malayan and the Indonesian part of Borneo. Kutai national park is one out of two places in Kalimantan, where you can get really close to Orang Utans. Around 60 Orang Utans live here on 2000km². Around the research station Prevab, where we stayed, there are around 25. And I’ve met three of them. 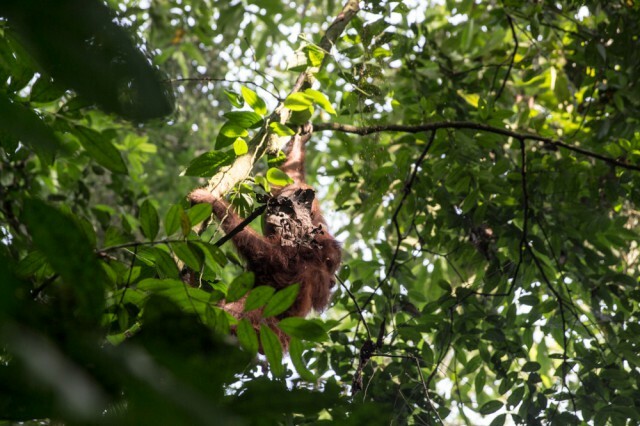 Quentin, a male Orang Utan, was suddenly sitting in a tree close to our terrace. He didn’t move at all while we were watching him. Completely quiet he was sitting there, staring into the jungle and was not at all impressed by us. I was standing there, open-mouthed, wishing I could pinch his cheeks (that’s not possible at all, I know) That night, under a mosquito net full of holes, on a simple mattress, I slept as good as I hadn’t in a long time. And early next morning, while the jungle was still cuddling with a blanket of fog, we went off again. Deeper and deeper into the jungle. Ranger ahead, and we behind him. Suddenly he stopped. Looked up and pointed a finger deep deep at a treetop. There she was. Labu (in english: Pumpkin) and her baby. So far away you barely could see her. If Orang Utans weren’t orange but green, she would have been invisible. And while the back of my neck started to hurt more and more from staring into the green above us, she decided to come closer. And all of a sudden she was sitting next to us, two meters away. Was eating leaves, hanging around as if this wasn’t anything special. Her baby stared at us a little bit irritated, maybe we were the very first tourists it had ever seen. And after ten, fifteen minutes, she gave us one last look, took the next branch and swung away. These few minutes, during she allowed us to be so close to her and her baby, where so unbelievable, so breathtaking, a stream of tears was dropping down my chin. Well maybe, maybe it was just sweat, dropping from my eyelid onto my nose. In Kalimantan, in the jungle, it can be really hot. Disclosure: I was invited on this trip by Reisecenter Federsee. Next Article VIDEO – Come fly with me. Or: How to be a pilot. Jealous I am. Looks like a great trip. Wow Yvonne, what an amazing experience! I can so understand the tear: the tear of being so close to these animals, the tear of being so deep into the jungle far away from home, the tear of witnessing what not many of us will ever witness, the tear of being so tired, the tear of nature fighting against extinction, the tear of…crystal clear beauty. Beautiful! What an amazing experience that you have so beautifully documented in these images! Some moments are perfect! Wow was ein Abenteuer! Wer ist wirklich bequemer haben will sollte auf der Malayischen seite nach Sepilok fahren. Wir habe viele Orangutans gesehen, den Urwald samt Nachtwanderung mit Schlangen und Blutegel und vieles mehr. Zugegeben das Resort daneben ist wirklich bequemer das Essen aber ganz schlecht. Wir haben so wie Du ein Baby gesehen, sogar ein Neugeborenes an dem die Nabelschnur noch hing, ich kann deine Traenen gut verstehen. Great photos – I’ve been really close to monkeys (maybe a little TOO close) but never that close to an orangutan! Oh my, that baby is just too adorable! It must have been amazing to see them in the wild. We’re hoping to get to Borneo this year to also see and learn more about the sun bears. Yup it’s true, as I remember, none of Indonesian call it Borneo. We just call it as it’s original name, Kalimantan. Well long time ago, in the era of Majapahit, it’s also known for Tanjungpura. Speaking about orangutans, yes they only live in Kalimantan (or borneo in english version) and Sumatra. They act closely like humans.